Land Rover has launched a new mobile phone which looks like being the perfect phone for those who like to GetOutside and be fairly sure that their device will be safe, and continue to function. 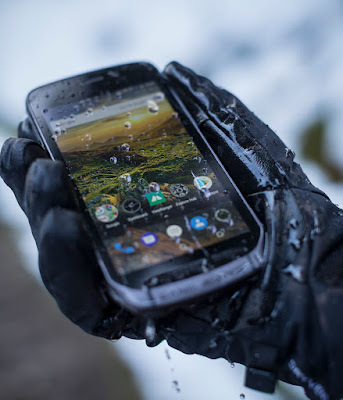 I've been prone to anxiety over damage, wet conditions and battery life in the cold in particular, and this phone is designed to get over those. At the heart of the Land Rover Explore is a powerful 4000mAh battery that gives two days of typical use, or a full day of activities, with constant GPS Navigation mapping activated on the 5” HD display. Battery life can also be doubled by adding the included Adventure Pack while on the go. Once added, it can replace the need for a separate GPS device with its GPS patch antenna that improves the reliability and accuracy of the GPS. It also adds additional 3600 mAh of battery power and premium topographic mapping with Skyline augmented reality, courtesy of ViewRanger. Also comes with a 16 megapixel camera which will be ideal for outdoor photography on the go. I hope to get my hands on one to trial in an educational capacity - a perfect geography fieldtrip phone.